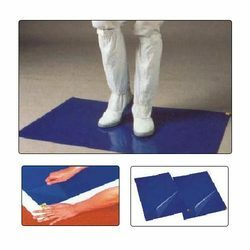 We offer a wide range of Clean Room Products that includes Antistatic Cover All & Jump Suit, Antistatic Aprons, Smocks and Jacket, ESD Head Caps, ESD Hoods, ESD Arm Bands, ESD Apron (Kitchen Wear Type), ESD Gloves & Booties, Sticky Mat, ESD Chair, ESD Wipes, ESD Brush, ESD Dispenser, Conductive Tweezers, Disposable Items, Finger Cots and Antistatic Clean Room & Knitted Fabric. These products are manufactured using latest technology that ensures optimum durability and reliability. Further, the entire range is tested on various quality parameters at our in-house quality testing facility. We offer a wide range of Antistatic Clean Room & Knitted Fabrics that are ESD & RoHS-certified. These do not contain heavy metal substances and are 100% bio-degradable. These are environment friendly and used in ESD & clean room class 1000 environment. Our company has also achieved great expertise in manufacturing a wide range of Sticky Mat that are widely demanded for removing dust from shoe soles to keep the surrounding clean. These Mats are available in different specifications that can be customized to suit the diversified requirements of the clients. We offer a wide range of Finger Cots that are designed with anti-static agents, which eliminate electrostatic discharge. These are static dissipative and independent of humidity or ingredient migration and disrupt the build-up of static on the hand. With ensured quality characteristics, these cots do not smudge or even extract contaminants being handled. We are also engaged in the sphere of manufacturing a wide range of Antistatic Cover All & Jump Suit that are designed to insulate the body from the cold of high altitudes and minimize risk of covering important handles and grips. These can be customized to suit the diversified requirements of the client within committed time frame. 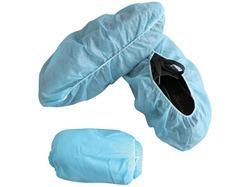 We are the largest Producers of NON WOVEN SHOE COVERS... From Automatic Machine..
ESD Shoe Covers and Groundable Shoe covers (with Conductive strip ) are also available..
We offer a wide range of ESD Aprons including disposabel NON WOVEN APRONS, that are an important consideration in most ESD protective areas, particularly in dry environments. These are recommended to minimize the effects of electrostatic fields or charges that may exist on a person's clothing. 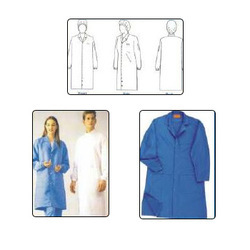 We have also designed a wide range of Antistatic Aprons, Smocks and Jacket that are manufactured with Antistatic Lint Free Fabric and Antistatic Knitted Fabric. These are provided with Smooth non-abrasive stretch wrist seals with Velcro adjustment, Front water resistant zip, Chest & side pockets with water resistant zips, Inner security pocket and Mesh lined. 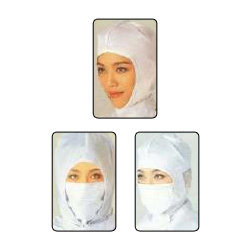 We also offer a wide variety of ESD Hoods that are used in chemical laboratories and hospitals. These are manufactured using latest technology with quality raw material that ensures optimum safety and reliability. Leveraging on our industrial experience, we can also offer the customized range of these ESD Hoods to our valued clients.